Smile, you beast. It's the world's fastest multi-player N64 racing, geared for people who love to cheat! Oh yeah. This baby's got it all! Ten wild cars. Five white-knuckle tracks. A beautifully giddy selection of wicked hair-pin turns, roller coaster hills and secret, shifty shortcuts. Plus: 6 full vocal BGM tunes. Challenging Mirror Racing Mode. The world's worst weather conditions. And: IT'S OKAY TO CHEAT! Once you get ahead you stay ahead by forcing the competition into interactive objects like traffic cones and road signs. Waaay cool. 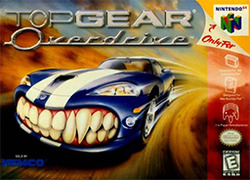 The one and only Top Gear Overdrive. Don't get mad. Get evil!